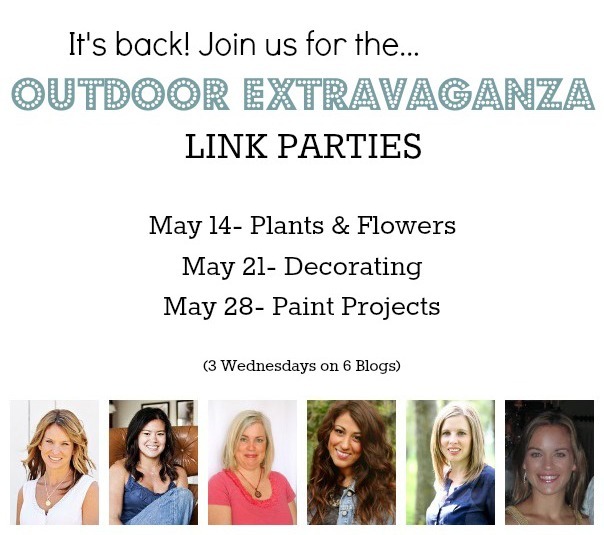 Get Ready for the Outdoor Extravaganza Link Parties! Spring is finally here, and that means it’s time to get ready for the annual OUTDOOR EXTRAVAGANZA! This time, I’m joining 5 other talented bloggers to share some of our outdoor projects, and we want you to show us what you’ve been busy working on outside, too! Be sure to mark your calendars. All dates and themes are above. Remember, the focus is outdoor projects, so start working on them now. We’re talking container gardens, outdoor dining spaces, DIY light fixtures, trellises and more. Procrastinating? In need of a little motivation to get going on some projects? This is it! Not only will your project be seen on all 6 blogs, but we’re also looking for fantastic ideas to pin, share, and feature! Here’s a little outdoor project inspiration from last year’s Outdoor Extravaganza to get the ball rolling. I have a few fun outdoor DIY and decorating ideas up my sleeve, and I can’t wait to show them to you. See you there! Oh, and we’d love it if you could spread the word (share buttons are below). Thanks! Sounds fun Shauna! I will have to get myself organized for this!! Would love to have you join. I’m guessing your projects will bring a little color to the table, which is always welcome! I love your Outdoor Extravaganza link-up series – that’s how we met! ;-) I’ve marked the dates, now I need to wrap my head around what I can do!! Yes, it was your sweet peas post, right? Looking forward to seeing what you come up with for this go-around!